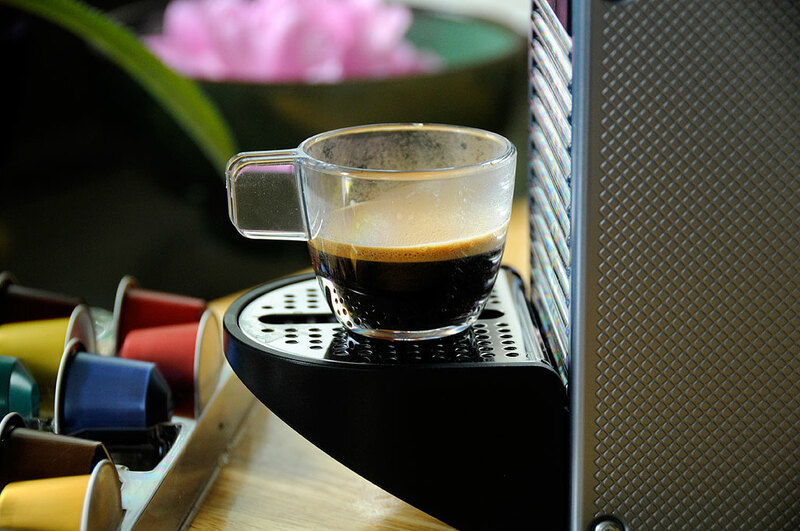 At the beginning of the month we posted our FirstLook of the Nespresso Pixie. We have had it for a over a week, have made a few cups with the unit, and are now prepared to tell you about our FirstUse experience with the unit. 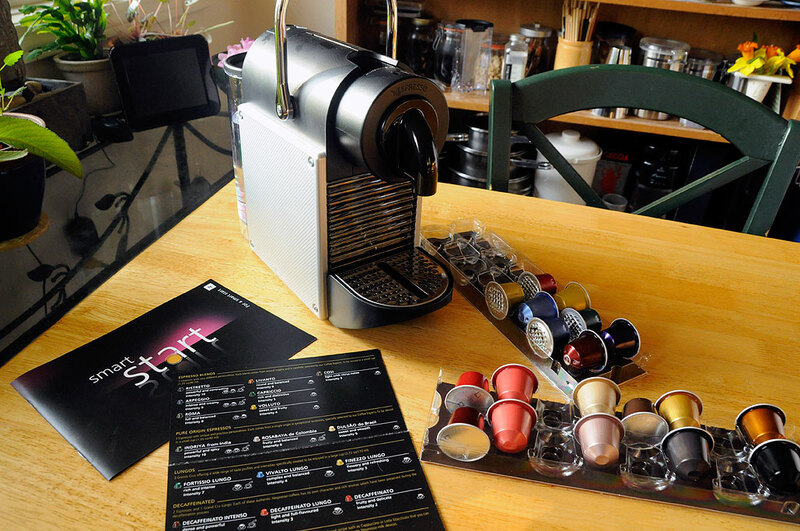 Along with the Pixie, every Nespresso unit comes with a sample pack of 16 different coffee capsules: 7 espresso blends, 3 pure origin espressos, 3 blends for large cups, and 3 decaffeinated blends. The included guide explained in more detail the personalities of the various blends, their intensity, and recommended brew amount (espresso size, or coffee cup size). As we did not have enough to do any meaningful comparisons, we will not comment on the relative flavor of one blend vs another. We will save that for a future head-to-head taste test review. The directions for prepping the machine for the first cup of coffee was simple enough. We turned it on, rinsed it a few times according to the instructions (first time use only), and in a few minutes, were ready to brew our first espresso. 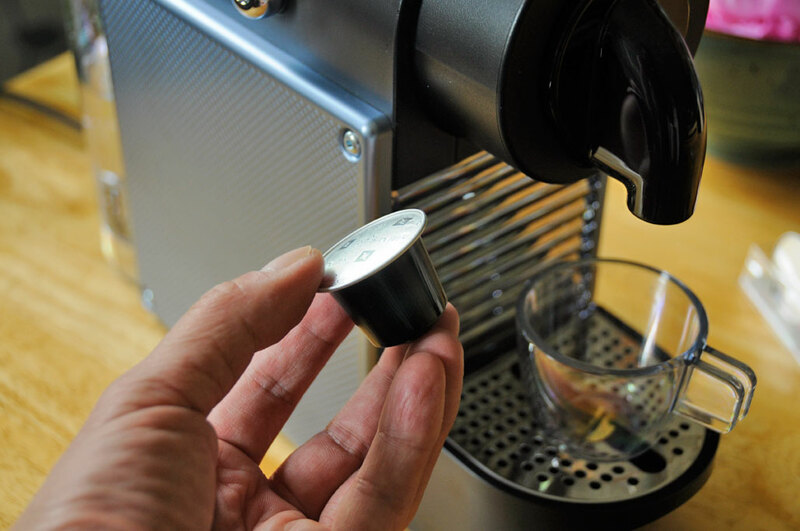 Using the Nespresso Pixie was about as simple as coffee making could get, other than having someone make it for you. The LED lights blink when it is heating up and shine stead when it has reached the proper brewing temperature. It took about 30 seconds for the unit to heat up. When the unit was ready, we pushed up the lever, popped in a capsule, lowered the lever, and selected the volume. The unit then groaned a bit (a little louder than we expected) and steamy stream of dark liquid began to out of the nozzle. The thing with machines that use prepackaged coffee capsules has always been the trade off between taste and convenience. At home, the convenience factor is not as big (you’re already home, after all), so some may opt to favor taste more. In the office, convenience is typically the bigger concern (and cleanliness; not everyone is as fastidious as our interns). However, with the Nespresso coffees, we have found them to be both flavorful AND convenient: pop in a capsule, push a button, get tasty coffee. Just check out that crema! Our only hesitation in recommending the Nespresso system was the amount of packaging involved and the trash generated with using capsules. However, it seems that Nespresso has already thought of that. 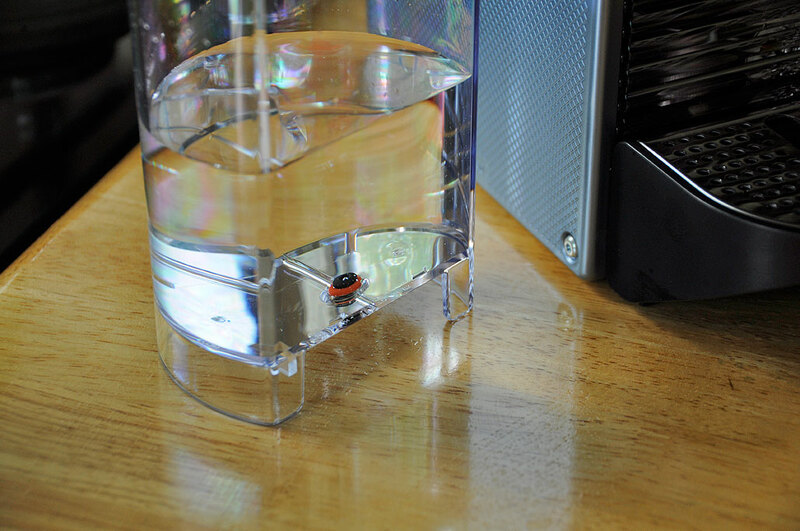 They chose to use aluminum for capsules precisely because it is easily recycled. The aluminum from the capsule is melted and reused, the coffee is turned into fertilizer or fuel. They have established capsule recycling systems in eight countries to collect and process the spent capsules, and more are being created. That’s pretty responsible and pretty cool. NOTE: Now you know why Starbucks can afford those nice comfortable leather chairs! We first emailed Nespresso, but after a few days and no response, we decided to give them a call. The person on the phone asked us a few questions, we explained the leakage issue, and to our surprise, they said they would have a new unit to us by Monday (it was Friday afternoon). It arrived on Saturday! Now, THAT is how to treat a customer. If you think we got special service because we are the Press, then you would be wrong. At no time did we identify ourself as such. If you have a problem, call instead of emailing. You will get much faster service. NOTE: A few days after we got the unit, we got an email saying we should call Customer Service to resolve the issue 🙂 Clearly Nespresso has more people answering the phones than replying to emails. 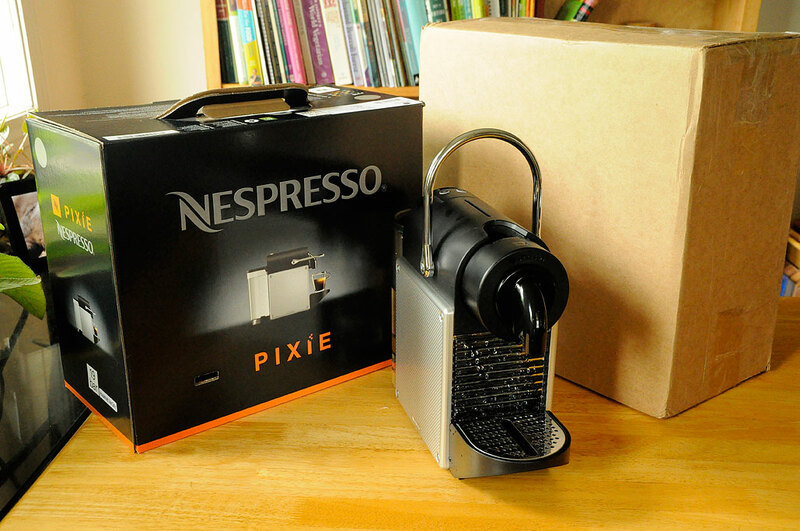 Overall, we were quite impressed with Nespresso Pixie. The machine is easy to use, makes great tasting coffee, and cleanup was…well, not necessary. And we were pleasantly surprised by Nespresso’s customer service. They were friendly, courteous, and efficient. Most importantly, they resolved our problem without ANY hesitations (they had no idea we were reviewing the unit). We will use this unit for a few months and let you know how it held up in the InTheWild report in the Fall.